GRB 170325A was detected by Swift/BAT at 2017-03-25 07:56:57.95 UTC. Because the spacecraft was slewing at that time, there was no onboard triggers, and the burst was found later in the ground analysis in response to Fermi-GBM trigger #512121423. Dec(J2000) = +20d 31' 32.5"
with an uncertainty of 2.0 arcmin, (radius, sys+stat, 90% containment). The mask-weighted light curve shows a single FRED-like pulse that starts and peaks at ~T0, and ends at ~T+0.4 s. T90 (15-350 keV) is 0.3 +- 0.1 sec (estimated error including systematics). The time-averaged spectrum from T+0.0 to T+0.4 sec is best fit by a simple power-law model. The power law index of the time-averaged spectrum is 1.06 +- 0.26. The fluence in the 15-150 keV band is 8.8 +-1.3 x 10^-8 erg/cm2. The 1-sec peak photon flux measured from T-0.30 sec in the 15-150 keV band is 1.1 +- 0.2 ph/cm2/sec. All the quoted errors are at the 90% confidence level. 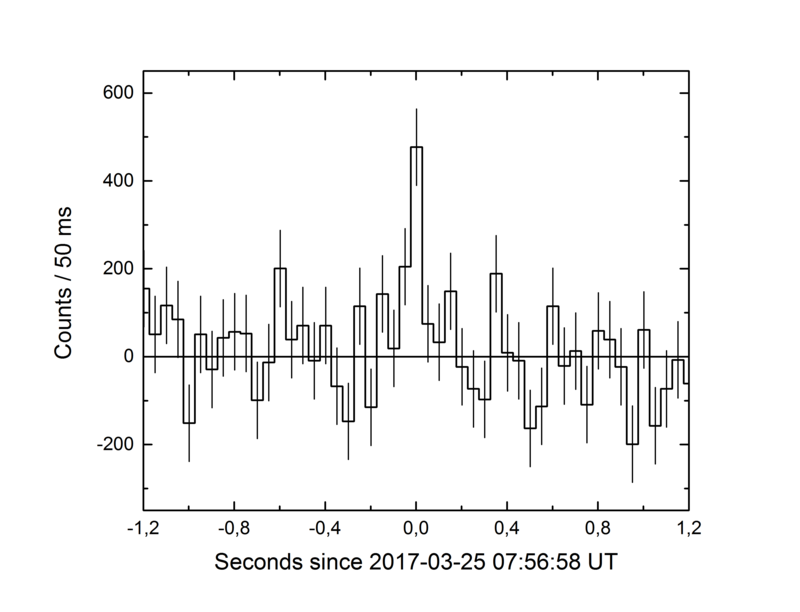 "At 07:56:58.04 UT on 25 March 2017, the Fermi Gamma-Ray Burst Monitor triggered and located GRB 170325A (trigger 512121423/170325331), which was also detected by the Swift/BAT (Palmer et al. 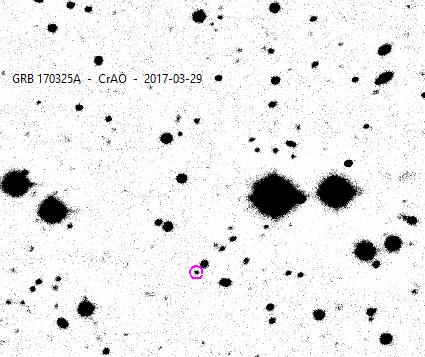 2017, GCN 20938). The GBM on-ground location is consistent with the Swift position. The GBM light curve consists of a single peak with a duration (T90) of about 0.58 s (50-300 keV). The time-averaged spectrum from T0-0.064 s to T0+0.192 s is adequately fit by a power law function with an exponential high-energy cutoff. The power law index is -0.7 +/- 0.2 and the cutoff energy, parameterized as Epeak, is 600 +/- 200 keV. The event fluence (10-1000 keV) in this time interval is (4.8 +/- 0.6)E-7 erg/cm^2. The 64-ms peak photon flux, measured starting from T0 in the 10-1000 keV band, is 7.6 +/- 1.1 ph/s/cm^2. We followed up the short GRB 170325A, detected in the Swift/BAT ground-based analysis (Palmer et al., GCN 20938), with the AMI Large Array as part of the 4pisky program. We note that this GRB was also detected by Fermi/LAT (Bissaldi et al., GCN 20940). Our observations at 15 GHz on 2016 Mar 27.01, Mar 27.84 and Mar 29.83 (UT; 1.7d, 2.5d and 4.5d post-burst respectively) do not reveal any transient source in the BAT error circle (Palmer et al., GCN 20938), which allows us to place 3sigma upper limits of 113 uJy, 85 uJy and 117 uJy respectively on the radio afterglow of the GRB. Цe followed up the short GRB 170325A (Palmer et al., GCN 20938) with AZT-33IK telescope of Sayan observatory (Mondy) an ZTSh telescope of CrAO observatory. The burst was detected by GBM/Fermi (Bissaldi et al., GCN 20940) and also detected as 5.5 sigma non-triggered IBAS event of 0.1 s duration of SPI-ACS/INTEGRAL (see http://grb.rssi.ru/GRB170325A/GRB170325_SPI-ACS.png). The source is not presented in SDSS-DR9, but clearly visible in r(=22.59), i(=22.10) filters, barely visible in u-filter (23.1), and not detected in g and z of SDSS images. We suggest the source is an afterglow and host candidates of the short GRB 170325A.